2Department of Pure and Applied Chemistry, University of Calabar, Calabar, Cross River State, Nigeria. 3Ladoke Akintola University of Technology, Ogbomoso, Oyo State, Nigeria. 4Ningbo Institute of Materials Technology and Engineering, Chinese Academy of Sciences, Zhejiang, China. Interestingly, copper has been identified as an ideal metal catalyst for an industrial scale electrochemical reduction of CO2 to various value-added chemicals relative to other metal catalysts reported so far. This is due to the fact that copper and copper-based materials have the potential to convert CO2 to oxygenates such as ethanol, methanol, formates etc. and hydrocarbons such as ethane, methane etc. Mechanistic details on how these products are formed on the catalyst-electrolyte interphase during the reduction process have remained relatively uncovered. This review, therefore, seeks to uncover the mechanism of electrochemical reduction of CO2 on Cu/Cu based electrodes, factors that affect catalytic activity and selectivity for these electrodes as reported in the various literature. This paper is therefore organized as follows: section 1 covers the introduction; an overview of some basic concepts in electrochemical CO2 reduction (ECR) was discussed in section 2, experimental studies were discussed in section 3, and finally the conclusion. Since theindustrial revolution of the 19th century, the global trend in technological advancement has always been on the increase, and so is the exploitation of fossil fuels (i.e., coal, petroleum and natural gas) as the main source of energy in order to sustain our economies and societies. These fossil fuels as non-renewable energy sources get depleted on an increasing basis which gives rise to a series of problems [1–3].On the one hand, the aforementioned advancement, coupled with rapid population growth has resulted to increased energy demand, while fossil fuels as non-renewable resources have very limited reserves, which is gradually leading towards an aggravated energy crisis. On the other hand, due to the huge consumption of fossil fuels, carbon dioxide (CO2) as one of the byproduct of the combustion of fossil fuels has been constantly emitted and kept accumulated in the atmosphere year by year. Studies have shown that, the concentration of atmospheric CO2as of 22th July, 2017is as high as 406.38 parts per million (ppm), which far exceeds the threshold safety value of 350 ppm for atmospheric CO2 .This increase in CO2 levels hasbeen associated with undesirable climatic effects such as globalwarming, desertification, rising sea levels, and more erratic weather patterns. Therefore, alleviating the effects caused by the heavy CO2 emission has become a pressing issue to the modern society [5,6]. Different strategies have been adopted for the reduction of CO2 emission and mitigating climatic change which include; the use of clean renewable energy sources such as solar, wind and tide in place of fossil fuels, and direct capture and sequestration of CO­2 for a long time isolation from the atmosphere (“carbon capture and Storage” CCS) [7–10]. The captured CO2 emissions can also be considered as a valuable resource becauseCO2 can be catalytically converted into industrially relevantchemicals and fuels. This is an extremely attractive approachbecause it can reduce the carbon footprint associated with fossil-fuel-powered processes, allow sustainable use ofcurrent fossil-fuel resources, and generate revenue to offsetcosts associated with other CO2 capture, storage, and transportefforts. Several methods have been proposed for the conversion of CO2 to value added chemicals; however, thermochemical, photochemical, and electrochemical CO2conversion are all promising catalytic approaches . ElectrochemicalCO2-conversion technologies are appealing becausethey operate with high reaction rates and good efficienciesunder ambient conditions, use environmentally benign aqueouselectrolytes, easily couple with carbon-free electricitysources (e.g., wind, solar, hydroelectric, etc.) and the reactionrate can be controlled easily by tuning the external bias (i.e.,overpotential) . Anotherbenefit of electrochemical CO2 conversion is that severalvoltage-dependent products are accessible, including formicacid, carbon monoxide, methane, and ethylene etc. [13,14]Although the electrochemical reduction of CO2 to value-added products has promise, the high overpotential of this reaction, low selectivity, production rate and activity of the currently known catalysts still hampers this processfrom becoming close to commercialization. This is backed by the fact that typical current densities have been in the order of milliamps per square centimeter (mA/cm2) of electrode and catalyst surface whereas industrial water electrolyzers operates at the magnitude of 2A/cm2 [15,16]. Current researches in this field are aimed at obtaining an ideal catalyst, capable of electrochemical conversion of CO2 at an industrial scale with improved efficiency, low overpotential and high selectivity towards a particular product. In this way, CO2 electrochemical reduction to liquid fuels and other value-added chemical feed stocks could become a sustainable way to store chemical energy in liquid forms. Studies have shown that several metallic elements such as Cu, Au, In, Sn, Pb, Zn, Ag, Pd, Bi and Carbon based materials are catalytically active for the electrochemical CO2 reduction in aqueous electrolytes [17–27]. However, several factors have been identified to affect the yield and type of products obtained during electrochemical reduction of CO2. These factors include; the type, nature and morphology of the metal electrode used as the catalyst, the type of electrolyte used, the medium in which the reaction was conducted, the applied potential and reaction conditions such as temperature and pressure. These aforementioned metals with catalytic activity for the reduction of CO2 are grouped into three classes based on the major products obtained during their electrochemical reaction. Elements such as Sn, Hg, Pb, and In, etc., are classed as group 1 metals because they generate formate or formic acid as their main products . Au, Ag, Zn, and Pd are typical representatives of the group 2 metals whose predominant reaction product is CO [15,16]. Cu is a representative of the group 3 family and greater attention is given to Cu/Cu-based materials because it is the only catalyst known to electrochemically convert CO2 to hydrocarbons and/or oxygenates such as ethanol at considerably high Faradaic efficiency (FE) . Intensive research efforts, both experimental and theoretical have focused on improving the overpotential and selectivity of Cu-based catalysts for the electrochemical reduction of CO2 to specific products. Among the range of value-added chemicals into which CO2 can be reduced to, ethanol and hydrocarbons receives more attention because of their economic importance and application as alternative sources of fuels (biofuels) other than fossils, they can also serve as feed stocks for various chemical industries. Several quality reviews have been published which discuss the catalytic conversion of CO2 to value added chemicals on various metal catalysts. However, few among such reviews were dedicated to Cu and Cu based materials. This review, therefore, seeks to dig deep into the world of Cu/Cu related catalysts in order to understand the mechanism of Electrochemical reduction of CO2 taking into note, the effects of electrolytes, morphology of the catalysts, nature of the crystallites, effects of functional groups, surface modification, grain boundary, effects of cocatalysts, Cu overlayers, effects of product selectivity and many more. The table presented in this review has been constructed using data from various sources. We have made as much effort as possible to present the data in a way that is useful to the reader, allowing one to compare results from different research groups, based on published results from various sources to generate all the relevant data. The quality of the published data, however, varied quite a bit and we had to make judicious choices in selecting relevant and reliable data. Linear CO2 molecule is a non-polar, fully oxidized and extremely stable molecule. Inducing a chemical conversion from this stable state requires efficient and robust electrocatalysts to promote this kinetically sluggish reduction process. Therefore, a real-world catalystsoften require large overpotentials (as can be seen where a single-electron reduction of CO2 to form CO2•– require as high as -1.9V vs RHE reduction potential; this high value is due to the rearrangement of the molecule from a linear to a bent structure. ), topromote the reaction at satisfactory rates and product selectivity. The energy needed for CO2 conversion should arise from sustainable low-carbon sources (e.g. solar, wind, tidal energy etc.) in order to have an impact on atmospheric CO2 concentration. The major challenge therefore, is to fabricate an electrocatalyst that can achieve high conversion efficiency, high product selectivity at low overpotential barrier. The mechanism for electrochemical CO2 reduction hasbeen studied for many years, with the typical aim of theresearch being directed towards understanding why differentmetals give different products. Researchers across the world have proposed and continue to propose novel reaction pathways for ECR based on their understanding of CO2 reduction on metallic electrodes. iii. Configuration rearrangement of products to desorb them from the electrocatalyst surface and diffuse into the electrolyte . The electrocatalyst employed and the electrode potential applied has a great influence on the final reduction products. In general, the reaction products are a mixture of carbon compounds with different oxidation states, and they often include carbon monoxide (CO), formate (HCOO−) or formic acid (HCOOH), methane (CH4), ethylene (C2H4), ethanol (C2H5OH), methanol (CH3OH), etc [31,32]. Since ECR is a surface phenomenon, there is no generalized reaction pathways towards the products obtained. In fact, the mechanism of the reaction must depends on the type, nature and morphology of the catalyst, the catalyst’s relative selectivity towards a particular intermediate (i.e. the relative ease with which a catalyst adsorbs and desorbs an intermediate), the number of electrons transferred and the energy barrier required for this electron transfer (standard reduction potential) as demonstrated by the sets of equations in the table below. As stated earlier, the electrochemical CO2 reduction reaction (CO2RR) occurs in three steps. The first step involves one-electron transfer to CO2 to form a key intermediate CO2•–, which is the rate limiting step in the reaction, largely due to the structural rearrangement from a linear molecule to a bent radical. This requires an enormous amount of energy usually, an overpotential of -1.9V vs. RHE is needed in order to promote this kinetically sluggish reduction process at a satisfactory rate. After the first step, the obtained CO2•– which is very reactive undergoes several proton-coupledmultiple-electron-transfer reactions, which are thermodynamically more favorable and takes place almost instantaneously. Where, α is the number of electrons transferred, n is the number of moles of the target product, F is the Faradaic constant and Q is the quantity of charge consumed or passed. This the difference between the applied potential (onset potential) versus the reference electrode under which the desired product is yielded at a detectale amount, and the standard reduction potential (Eo) which is given as ɳ = (Eapplied – Eo). Current density for CO2 reduction is the ratio of the magnitude of current to the geometric surface area of the working electrode. Partial current density for specific products can be obtained by multiplying the corresponding FE by the overall current density. As stated earlier, Cu is the only metal catalyst that shows catalytic activity towards electrochemical reduction of CO2 to variety of hydrocarbons and alcohols. This unique ability therefore makes Cu and Cu related catalysts to be seen as ideal materials to be used for commercial and/or industrial CO2 conversion to value added chemicals in order to solve energy and environmental problems arising from excessive atmospheric accumulation of CO2 gas. Researchers around the world have dedicated their time, energy and resources, exploring novel materials and structures as well as the dynamics of this catalytic process on the metal surfaces. Even though this area of research is still growing and the current progress recorded is still far from commercialization, the useful contributions of these researchers and their findings are making headway for the future, and some of these findings shall be discussed in this section taking into consideration, the mechanisms of their electrochemical reduction and the factors that affects the selectivity, improved overpotential and faradaic efficiency of the products obtained. Loiudice et al fabricated Cu Nanocrystals (NCs) used for CO2RR . Their study reveals a structure/property relationship between the fabricated Cu Nanocrystals and their catalytic activity. The selectivity over Hydrogen Evolution Reaction (HER), and activity of the NCs towards C2 products predominantly C2H4, depends on the morphology as well as the size of the nanocrystals. Within the same morphology, smaller NCs exhibited higher activity; however, overall, the cube-shaped NCs where more intrinsically active than the spheres. The Cube-shaped NCs (24nm, 44nm, and 63nm sized NCs) shows a non-monotonic size-dependent selectivity in which the 44nm cube-shaped NC exhibited the best catalytic performance with 80% efficiency towards selectivity of CO2RR over HER and FE of 41% forC2H4 as shown in table S1. This recorded selectivity was attributed to the presence of active sites on the surface of the Nanocrystals (plane, edge and corner). The X-ray Diffraction pattern (XRD) reveals that the (100) plane facets predominate on the surface as shown in the model used in Figure 1. As the size of the Nanocubes increases, the relative number of atoms on the edges and the corners decreases while the number on the planes increases. This therefore results into a surface configuration closer to one single crystal with all the surface atoms lying in the (100) plane. The studies concluded that, since uncoordinated sites in Nanocrystals such as corners, steps, kinks, etc. favors HER selectivity, the trends of the Cu Nanocubes towards coordinated (100) plane sites are responsible for the improved CO2RR selectivity. This active sites/size trend suggests that the unique reactivity of the 44 nm Cu NC cubes derives from an optimal balance between plane and edge sites, while the edges are responsible as ethylene-selective active sites in the Cu NC cubes. Song and co-workers  reported the catalytic activity of Cu Nanocrystals on a highly textured N-doped Carbon Nanospikes (Cu/CNS) whose selectivity was 84% and the FE of 63% at -1.2V vs RHE for ethanol production (S1). Fig. 1. 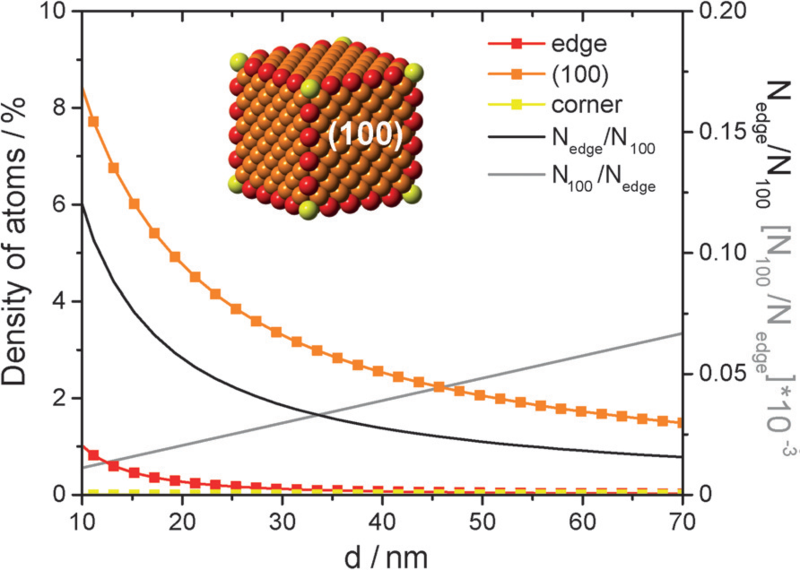 On the left axis: Density of adsorption sites in Cu NC cubesreported versus the edge length (d). On the right axis: trend of Nedge/N100 and N100/Nedge versus d, where Nedge is the number of atoms atthe edge and N100 is the number of atoms on the (100) plane. From . the C1 intermediate. This preference was suggested to be as a result of the nanostructured nature of the surface which improves the stability of the adsorbed C1 intermediate keeping it long enough until a second intermediate is available for C2 coupling. The aforementioned coupling can be between two surface bound intermediates or between surface bound intermediate and a nearby C1 intermediate in solution. Furthermore, the ethanol production dominates the competitive reduction of the coupled C2 to ethylene or methane. This unique behavior was reported to be as a result of electron-withdrawingeffects in the graphene π-conjugated system, which in turn, polarizes the carbonatoms adjacent to nitrogen positively. This polarization was suggested to provide an active site adjacent to the copperfor the C2 intermediates to adsorb, which may inhibit completeelectroreduction. Density Functional Theory (DFT) calculations performed by the group also suggested that the strongly curled morphology of the CNS aids in the adsorption of C2 intermediates. CNS reported in this study was puckered curled, indicating local corrugation on the surface. Such local deformation and curvature naturally embedded into the CNS could help in strengthening the bond between C2 and CNS. The group also studied the interaction between C2 intermediates (OCCO) and the Cu surface; they found out that there is a strong Covalent bond when the molecule approachesthe Cu surface oriented with one end closer to thesurface. This covalent bond is comparatively stronger than the OCCO/NCS bond which ensures that desorption of C2 intermediates are prevented, the group therefore proposed that, the C2intermediates is covalently bound on reactive coppersurface for complete reduction to -CH3, while the oxygen atomon the other end of the C2 intermediates is adsorbed on lessreactive CNShence forming -CH2OH, and protected from competitive reduction, thereby providing a pathway towardsselective reduction to ethanol. Zhiyuan et al  reported highly selective reduction products on Ag@Cu Bimetallic catalyst. The group fabricated an Ag@Cu core-shell system whose Nanoparticles were controlled by tuning the heating reaction time in a simple polyol reduction method (0-20mins) and the following were obtained Ag@Cu-5, Ag@Cu-7, Ag@Cu-10,Ag@Cu-15, Ag@Cu-20, Ag@Cu-25 respectively (i.e. Ag@Cu-reaction time). The peak activity was recorded at Ag@Cu-7 for CO generation whose FE was 82% and decreases dramatically to 20% for Ag@Cu-10, while Ag@Cu-20 gave a peak FE of 28.6% for C2H4 (S1), as this clearly demonstrates that Ag@Cu-7 (Agdominant) and Ag@Cu-20 (Cu dominant) bimetallic materials achieved better activitiesfor CO2RR than other counterparts. The authors pointed out that there exist a composition and structure dependent activity and selectivity in the series of the as-prepared Ag@Cu bimetallic catalysts, and that geometric effects rather than electronic effects was the key factor in determining the selectivity. The peak activity at Ag@Cu-7 towards CO as suggested, resulted from functional Ag (modified) with more oxygen affinitive Cu via oxygen-metal interaction which helped to stabilize *COOH intermediate, a key point to lower the energy requirement for CO2RR and gain higher FE towards CO. Furthermore, the small amount of Cu for Ag@Cu-7 cannot offer the possibility to stabilize of *CO intermediate to protonate successively to hydrocarbons. Conversion to ethylene came as a result of the increase in Cu content at Ag@Cu-10 and above. They concluded that, Synergistic reactions rather than pure dilution effects between Ag and Cu for these AgCu bimetallic electrocatalysts mainly derived from the mixing pattern of the components played an important role in producing the higher CO or hydrocarbons. Ma and co-workers  reported Cu-Pd bimetallic catalysts with different mixing patterns used for the electrochemical reduction of CO2. Their study examines a range of bimetallic Cu-Pd catalysts with ordered, disordered, and phase-separated atomic arrangements(Cuat:Pdat=1:1), as well as two additional disordered arrangements(Cu3Pd and CuPd3 with Cuat:Pdat=3:1 and 1:3). The result reveals high selectivity for C1 products(mainly CH4) in the ordered structure while the phase-separated and the Cu3Pd exhibited high selectivity for C2 products (S1) where the following cases were observed; CO isan important precursor for C2 chemicals production andthe phase-separated CuPd catalyst converts adsorbed CO to C2chemicals more easily than the ordered CuPd catalyst, withlatter converting adsorbed CO more easily to CH4 than the phase-separatedcatalyst. The high selectivity of the phase-separated CuPd structure for C2 products was as a result of dimerization of adjacently adsorbed CO to COCOH intermediates due to interacting neighbouring features of Cu atoms with favorable molecular distances between them and small steric hindrance. Similarly, the preference for CH4 on the ordered CuPd structure was due to presence of Cu-Pd intermetallic structures which adsorbs CO on a Cu and further converts it to CHO intermediate whose oxygen atom is partially adsorbed to Pd atom which stabilizes the adsorption of CHO intermediate and favors the production of CH4. The study also reveal that, as the concentration of Cu increases from Pd, CuPd3, CuPd, to Cu3Pdand Cu, the FEs for C2 products increase which further supports the idea that the dimerization of adsorbed CO toform C2 chemicals may be preferred on the sites with neighboringCu atoms. The group therefore concluded that the selectivity of the Cu-Pd bimetallic catalyst can be determined by geometric effects. This implies that the selectivity of different products can be tuned by altering the geometric arrangements of the catalyst. Lum et al  reported that Trace Levels of Copper in Carbon Show Significant Electrochemical CO2 Reduction Activity. The study investigated the catalytic activities of pure graphite (PG), graphene oxide (GO), and carbon nanotubes (CNT) dispersed on glassy carbon (GC) for the electrochemical CO2 reduction reaction in aqueous solution (S1). It was observed that the above-listed carbon support materials all exhibited significant electrocatalytic behaviours attributable to the presence of impurities in them. However, the presence of Cu as impurity in GO configuration reveals a significant yield of methane. Interestingly, it was revealed that the catalytic activity of the GO support material dropped significantly when nearly all the impurities were washed away in ultrapure nitric acid. On reintroduction of Cu, the catalytic behavior surfaced which increases with increase in the amount of Cu deposited. On comparison between Cu electrodeposited on GO/GC, PG/GC and GC systems, it was revealed that the activity per mass of Cu is ~ 4-5 times higher for GO/GC or PG/GC than GC, attributable to preferential deposition of Cu NPs at defects present on the graphene layers ofGO and PG with latter having the highest activity for methane production (S1). The group therefore suggested that, a highly active catalyst for methane formation via the CO2RR can be created for the future by the introduction of defects into graphene layers, onto which Cu can then be electrodeposited. Hahn and co-workers  studied the surface structure of Cu thin films catalysts in order to probe the relationship between active sites and catalytic activity for the electroreduction of CO2 to fuels and some value added chemicals. In their study, they reported a vapor deposition of Cu thin films on large-format single-crystal substrates(Al2O3(0001), Si(100), and Si(111)), and confirm epitaxial growth inthe (100), (111), and (751) orientations respectively. Results of electrochemical CO2 reduction reveals that the three orientations all make > 2e– reduction products in the tested potential range between −0.89 and −1.10 vs. RHE. However, Cu(100) and Cu(751) are both active and selective for C-C coupling reaction than Cu(111) and Cu(751) is the most selective for the > 2e– oxygenate formation at low overpotential. The group pointed out that the difference in selectivity could be due to due to a lower kinetic barrier for CO dimerizationon Cu(100) compared with Cu(111). This therefore suggest that there is a strong correlation between C–C couplingselectivity and the coordination number of the surface, which was favoured by the less coordinated Cu(100) and Cu(751) than the more coordinated Cu(111). On the other hand,analysis of oxygenate vs. hydrocarbon selectivity was conducted on the three orientations and they came to a conclusion that at −0.89 V vs. RHE, Cu(751) has the highest oxygenate/hydrocarbonratio, and the group put forward a suggestion that thisimprovement in oxygenate selectivity is related to the fewernumber of nearest neighbors on the Cu(S)–[n(110) × (100)] (in situ surface structure of Cu(751) where n varies from 2 to 7) surface,or the topmost layer of the Cu(751) film, because barriers forhydride transfer are predicted to be lower than those for protoncoupledelectron transfer at lower overpotentials. Fig. 3. 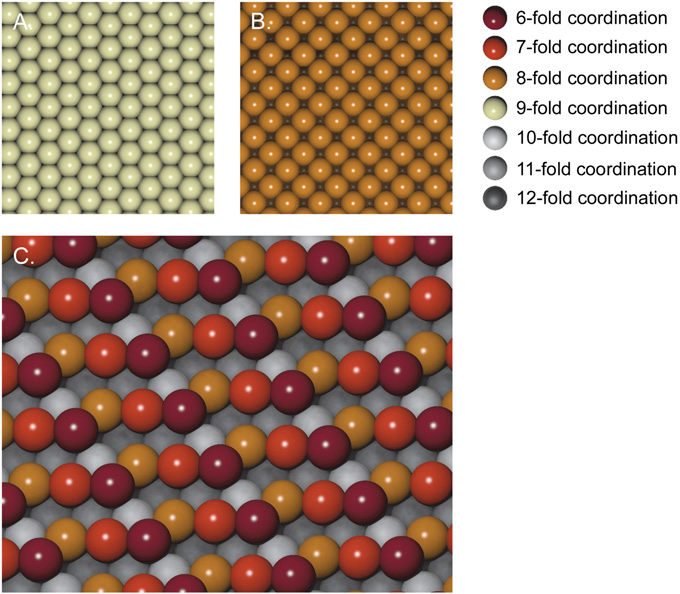 Color-coded atomic models showing coordination numbers for the (A) Cu(111), (B) (100), and (C) (751) surfaces from . Zhang et al  investigated CO2 electroreduction on Cu overlayers ontetrahexahedral Pd nanocrystals (THH Pd NCs) with (310) high-index facets. The study reveals catalytic activity/selectivity towards alcohols (ethanol and methanol). Cu1ML/THH Pd NCs exhibited high activity and selectivity for CO2electroreduction to ethanol with ~20% FE at -0.46 V vs. RHE. The selectivity of the alcohol was readily tuned by varying the coverage of Cu on THH Pd NCs in which methanol was obtainedat Cu0.8ML/THH Pd NCs with FE of 19.5% (S1). According to the group, the results demonstrate that the electroreduction of CO2 is asurface-structure-sensitive reaction and the (310) high-indexfacets facilitate the formation of ethanol. Mixed Iron-Copper (Fe-Cu) oxide catalyst was reported by Yang et al  for the electrochemical reduction of CO2 to Acetate with FE of 80% and 76% Using Ar-purged, phosphate-buffer and NaHCO­3 electrolytes respectively (S1). The catalyst reported here is a mixed phase material consisting CuFeO2 and CuO. The study reveals that competing production of formate over the mixed structure existed which was favored by the increase in concentration of Cu relative to Fe. In this study, the selectivity of the catalyst towards either acetate which is the primary product or formate is a function of the iron-copper atomic ratio represented as Fe:Cu. At a ratio of 1:3, the catalyst favours the production of acetate but as the concentration of Cu increases relative to Fe from 1:3 through 0:5, and 0:1, the products obtained was predominantly formate. This result therefore suggest that by varying the Fe:Cu atomic fractions, the selectivity of the catalyst can be tuned from primarily acetate to primarily formate. Furthermore, the morphology of the as-prepared catalysts is also a function of their composition which was reported that the grain size decreases slightly as a function of increasing Fe:Cu ratio. Copper Nanofoams with hierarchical porosity was investigated for the electrochemical reduction of CO2 . This study reveals improved product distribution and Faradaic efficiency which far exceed that obtained from smooth electropolished Cu electrodes (S1). This result was attributed to high surface roughness, hierarchical porosity, and confinement of reactive species. Oxide-derived CuxZn catalysts was reported by Ren et al , used for the electrochemical reduction of CO2. Where CuxZn = Cu10Zn, Cu4Zn, and Cu2Zn. Here, Cu and its oxides are used to demonstrate that the selectivity of CO2 reduction to ethanol can be improved by introducing a co-catalyst to generate an in situ source of mobile CO reactant, achievable by doping the Cu-based oxides with varying amounts of Zn dopants which was also accountable for tuning the selectivity for the production of ethanol over ethylene by a factor of ~12.5. Peak production of ethanol was recorded on Cu4Zn at at −1.05V vs RHE, with a Faradaicefficiency of 29.1% and a partial current density of −8.2 mA/cm2(S1). Fig. 4. 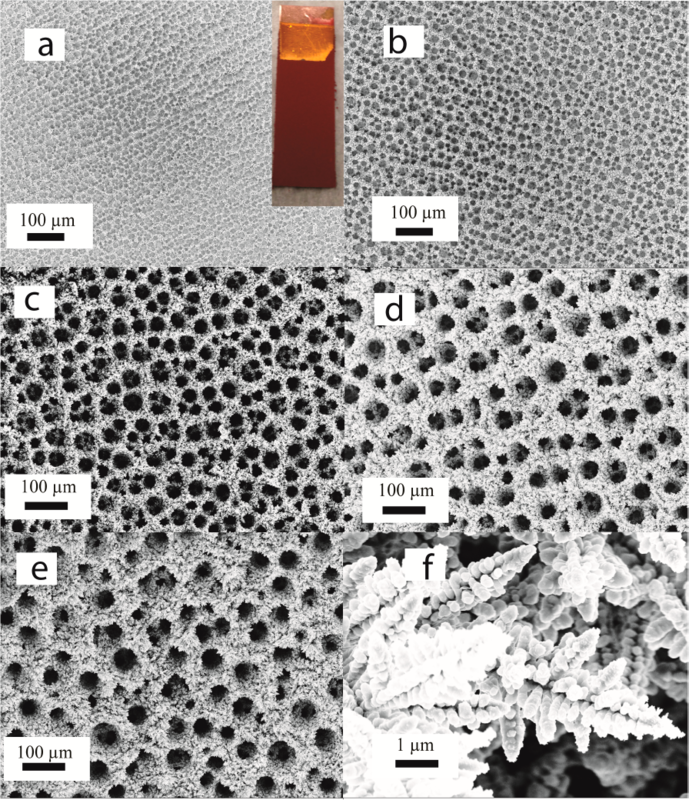 SEM images of electrodeposited copper foams on a coppersubstrate for (a) 5s; (b) 10s; (c) 15s; (d) 30s; and (e) 60s; (f)nanostructure of the electrodeposited foam, copied from . The formation of ethanol and ethylene on CuxZn surfaces could be as a result of synergistic interaction between Cu and Zn which promotes the formation of ethanol. The group therefore postulated that, gaseous COformed from the Zn sites may have further reacted togive ethanol. This postulation is strengthened by the observationthat the potential where the FE of ethanol had peaked shifted to a more negative value on Cu4Zn, and Cu2Zn in comparisonto Cu catalyst. This is because the CO needed for enhancedethanol formation could only be generated in greater quantitieson the Zn sites at more cathodic potentials. They also proposed in the mechanism of reaction that, for ethanol to be produced on a roughened surface such as CuxZn, CO is needed for insertion into the bond between into the bond between Cu and *CH2 to form *COCH2, whose further reduction yields acetaldehyde and finally ethanol. Similarly, selective electrochemical CO2 reduction to ethylene and ethanol on copper (i) oxide catalysts was investigated by Ren and co-workers . In this study, they found out that the Faradaic yield for both ethylene and ethanol can be systematically tuned by changing the thickness of the deposited overlayers. Peak selectivity was observed for the film thickness of 1.7−3.6μmat −0.99 V vs RHE, with faradic efficiencies (FE) of 34−39% forethylene and 9−16% for ethanol (S1). This selectivity was optimized according to material analysis, with the 1.7−3.6-μm-thick films, which consisted of 0.5−1-μm-sized Cu polyhedron particles. They also proposed that during the the CO2 reduction, stepped surfaces with edges and terraces are likely to be formed as copper (i) oxide reduce to metallic Cu. Therefore, the optimum combination of these features must be necessary to dissociate CO2 and to optimize the chemisorption energies of the CHxO intermediate. Edeges with under-coordinated Cu atoms plays a vital role in promoting the buildup of a largecoverage of CHxO reactive intermediates, to facilitate theirdimerization. The study was concluded that variation of the local pH at the surface of the catalyst was also a factor that boosts the calalysts’ selectivity; however, higher selectivity was attributed to step and edge morphological features of the catalysts. Recently, Reller and his group of co-workers  reported Nano Dendritic Cu catalysts which were selective for the electrochemical reduction of CO2 towards ethylene at high current density. The result reveals a 57% FE for ethylene and a current density of 170mAcm-2 (S1). The dendritic structure consists of mainly Cu and Cu2O. In situ deposition of Cu in acidic pH environment forms the catalytic layers which enables the selective formation of ethylene. It was also revealed in the study that, the catalytic performance of the material does not depend on the support material. Furthermore, structural changes of the active sites were observed during the electrolysis such as sintering and/or dissolution/re-deposition and oxidation of the Cu, results to structural degradation and coarsening of the initially formed active species. This leads to the lost of the much required high index facets with low coordinated sites responsible for the formation of ethylene, thereby, creating new catalytic centers having lower hydrogen over potential which favors the formation of hydrogen. Core/Shell Cu/SnO2 structure as explained above, accounts for the preference and could be used to tune the selectivity of electrochemical CO2 reduction towards CO products. 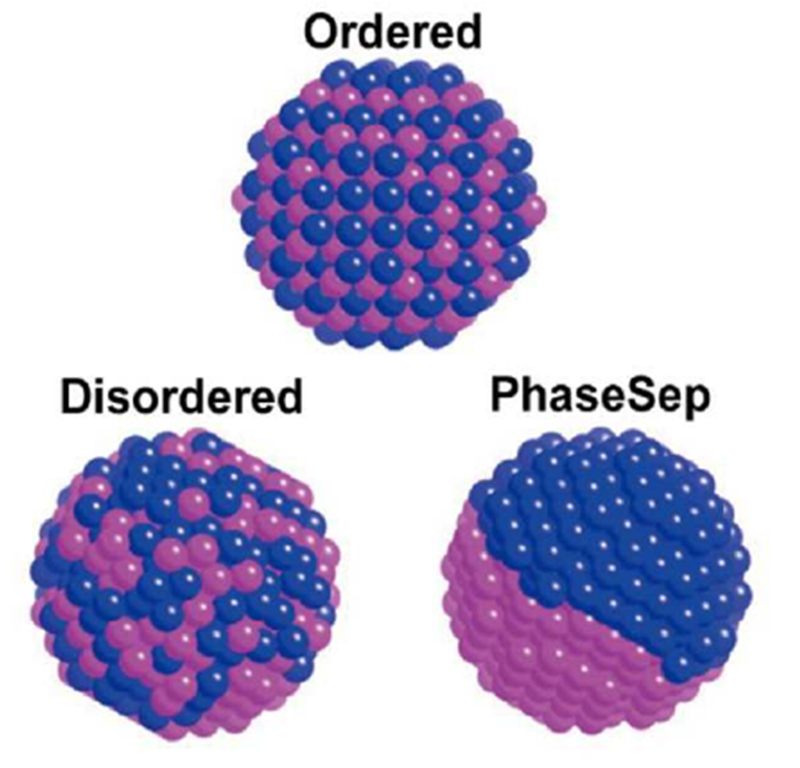 The yield behavior of an electrodeposited cuprous oxide thin film was examined by Le et al . The study explored the relationship between surface chemistry and reaction behavior of the aforementioned material system, relative to air-oxidized and anodized Cu electrodes. Higher yield and faradaic efficiency (38%) for CH3OH was observed at Cu(i) active sites as compared to air-oxidized and anodized Cu electrodes (S1). This suggest that, Cu(i) active sites might have played a vital role in the catalyst’s selectivity to CH3OH. The results also, revealed that at the required potentials for CO2 reduction, copper oxides are reduced to metallic Cu and the products yields are dynamic. Furthermore, it was revealed that the Cu(i) active specie may be responsible for improving the stability of the intermediates, and enhance the selectivity towards CH3OH by enabling hydrogenation of oxygen atomsfrom H3CO adsorbates. Ke and co-workers reported a CuO-derived porous copper nano ribbons array , used to electrochemically convert CO2 to C2 products. At applied potential of −0.701V vs RHE, the C-C coupling reaction is favored whose total Faradaic efficiencytowards the formation of C2H4, C2H6and C2H5OH reached up to ~40% (S1), while suppressing the formation of C1 products. According to this study, the preference for C2 products over C1 products can be attributed the presence of surface defects and large number of grain boundaries on the CuO-derived copper nanoporous ribbon arrays. The roughened porous channels of these electrodes allowed forfacile diffusion of electrolyte and provided large number of activestep sites for CO2reduction. Similarly, Electrochemical CO2 reduction on Cu2O-derivedcopper nanoparticles was studied by Kas et al , by controlling its activity towards hydrocarbon production. In this report, selectivity of the CO2 electroreduction was found to depend largely on Cu2O film thickness, rather than on the initial crystal orientation. This was due to the fact that the Cu2O reduction itself seems to be highly favored relative to the CO2 reduction or water splitting. Therefore, the catalytic behavior was predominantly due to the layer thickness associated withlocal pH changes, impactingthe hydrocarbon selectivities. The group therefore suggests that optimum numberdensity of nanoparticles with the combination of the rightelectrolyte (pH) can open up routes for highly selective ethyleneformation via electrochemical CO2. Hossain and co-workers performed the electrochemical reduction of CO2 Using copper/reduced graphene oxide nanocomposite catalysts (Cu-rGO) . The study reveals a catalyst which could effectively reduce CO2 to CO, HCOOH and CH4 with a Faradaic efficiency of 76.6% at -0.4V vs RHE and excellent stability (S1). Uniformly distributed small Cu nanoparticles on the rGO and the synergistic coupling effect of the formed nanocomposite were responsible for the superior electrocatalytic activity and stability of the Cu-rGO nanocomposite achieved in this study. The electron transfer between the rGO and Cu nanoparticles might have increased localizedelectron concentrations, resulting in significant enhancement of the catalytic activities of the nanocompositefor the electrochemical reduction of CO2. In a research work conducted by Hoang et al , nano porous copper films were fabricated by additive-controlled electrodeposition (i.e. 3,5-diamino-1,2,4-triazole (DAT) as an inhibitor), used in CO2 reduction catalysis. By varying different synthesis parameters such as pH and deposition current density, the morphologies of the thin films are tuned into dots, wire and amorphous structures. The wired structure exhibited the best catalytic activity with high Faradaic efficiency for C2H4 product as reported in table S1. According to this report, the Cu films produced active sites i.e. small and stable pores which allow for gas permeability thereby, making the resulting structures tunable depending on the deposition conditions. On the same vein, the preference of the Cu-DAT wire structure for C2 over C1 products was reported to be as a result of the presence of steps and edges with low coordinated Cu atoms which promotes the adsorption of C1 products and its subsequent dimerization to C2 products. Cu2O-derived Cu catalysts were studied by Handoko et al . In their findings, they reported that there exist, an inverse relationship between the crystallite sizes of the Cu2O-derived Cu particles and the selectivity of the CO2 reduction towards C2H4. Interestingly, decrease in the particle’s crystallite size from 41 to 18 nm, results in an increase in the Faradaicefficiency (FE) of C2H4 formation increased from 10 to 43%.It was also revealed that samples with smaller particle crystallitesizes were found to possess more diverse adsorption sites for CO intermediate, which we is important for C−C coupling of C1 adsorbates. The group therefore asserts that, this result could offer a better platform to fully explore Cu2O-derived Cu as ideal catalysts for producing chemical feed stocks and fuels from CO2 reduction. Plasma activated Cu nanocube catalysts with tunable Cu (100) facet morphology, defect and oxygen contents was recently studied by Gao and a group of co-workers . Their findings reveal high catalytic activity and selectivity for ethylene and ethanol (S1). This high catalytic performance was ascribed to the presence of defects, surfaceand subsurface oxygen species, including oxygen ions associated with Cu+species, achievable by tuning the catalysts’ morphology and defect density, ion content, and surface roughness via plasma induced pre-treatment. This group therefore concluded that, the presence of oxygen species in surface andsubsurface regions of the nanocube catalysts is key for achieving high activity andhydrocarbon/alcohol selectivity, even more important than the presence of Cu(100) facets. Oxide-derived mesoporous foam catalyst fabricated via template assisted electrodeposition process by Dutta et al , was reported to selectively reduce CO2 to C2H4 and C2H6 with a combined Faradaic efficiency of 55% for the C2 product as shown on S1 table. This high selectivity was attributed to due to the availability of the surface sites (i.e. surface pore diameter) for C-C coupling reaction and the temporal trapping of gaseous CO and C2H4 intermediates inside the mesoporous catalyst material during CO2 electroreduction. 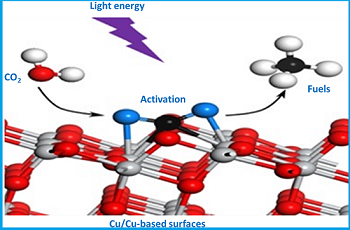 As reported, the key point to the creation of a high abundance of surface active sites for C-C coupling for the catalyst activation was the in operando reduction of a Cu2O phase. In a research work reported by Chung et al , a series of hierarchical Cu electrodes were used to catalytically convert CO2 to formic acid and a negligible amount of CO. The peak activity was recorded for the member of the series Cu-h 5 electrode, in which it demonstrated an FE of 28% as shown in S1. This peak activity was due to increased (111) facet in the electrocatalyst which energetically favoured HCOOH production. This is because the majority of the surface lattice, the (111) facet, leads to the formation of F-intermediate,and as a result, CO2 is mostly reduced to HCOOH. Anotherwell-known intermediate, C-intermediate, which bind to the(100) facet, is presumably reduced to HCOOH. This is becauseenhanced electron transfer amplified by surface modificationassists the reduction to end up with HCOOH and hinders COformation. The electrochemical reduction of CO2 to C2H4 and subsequent hydrogenation to C2H6 was observed for a Cu2O-derived Cu/PdCl2 catalyst by Chen et al , a significant FE for ethane was observed as shown on S1. Detailed mechanistic studies revealed that, CO2 was first reduced to C2H4 at the Cu sites and then underwent hydrogenation with the help of the adsorbed PdClx to generate C2H6. Interestingly, both sites are responsible for the reduction to C2H4 and subsequently to C2H6, but it was inferred from the study that, PdCl2 dopants alongside a working electrode could offer a new methodology to expand on the type of products that could be obtained from a CO2 building blocks. The product yield and the relationships between surface chemistry and reaction behavior for surface oxidized copper electrodes were investigated by Keerthiga et al . Even though there was no clear explanation for the enhanced production of ethane as the major product during electrochemical reduction of CO2 at the surface of the electrodes, it was hypothesized that Cu (i) specie plays a vital role in the selectivity of the catalyst, further investigation was recommended by the group in order to understand the mechanistic details of the reaction. Cu nanoclusters on single crystal (1010) ZnO electrodes were studied by Andrews and co-workers . By comparing the catalytic activity/selectivity of Cu electrodes and Cu nanocluster-ZnO electrodes at a potential of -1.4V vs Ag/AgCl, it was observed that there was improved selectivity for methanol and ethanol recorded for Cu/ZnO electrode. FT-IR analysis on the products obtained revealed a characteristic absorption behavior for formats and methoxy adsorbates. The mechanism for the formation of ethanol was not clear, however, the methoxy adsorbates were closely associated to alcohol since other products were obtained experimentally. Several possible mechanisms that could lead to enhanced alcoholselectivity were proposed, including reactions at Cu-Zn interfaces or charge effectsarising from ZnO substrates. The ZnO may strengthen the Cu-C bond via σ-donor interactions and π back-bonding which allows for improved hydrogenation of the carbon atom, increased methoxy generationand selectivity to alcohols. However, theCu-ZnO electrodes demonstrate a stable surface for continuous CO2reduction and significantly increase in alcohol yields, independent of the aforementioned pathway. Lv et al  reported a Tin based film on copper plate, used for the electrocatalytic reduction of carbondioxide to formate. This shows a catalytic performance with a Faradaic efficiencyy of 74.1% as shown in table S1. This catalytic activity was influenced and enhanced by exposing the Sn/Cu electrode to air. The as-prepared Sn/Cu electrode exposed for 24 hours shows better catalytic performance for CO2 reduction, which was explained to be as result of the Sn film surface which became gradually oxidized and form an oxide layer which can inhibit the competing Hydrogen Evolution Reaction (HER). 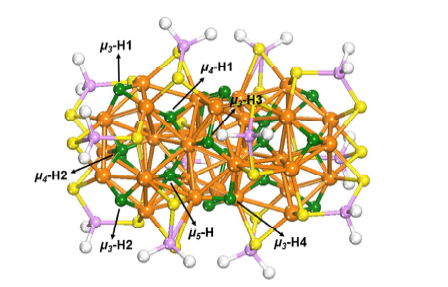 A research work conducted by Tang et al , reported a structurally precise copper-hydride nanoclusters (Cu32H20L12where L is a dithiophosphate ligand). In this study, the major product obtained by the electrochemical synthesis on the nanocluster was HCOO– with over 80% selectivity, with other minor products such as CO and H2 at low potentials. Density Functional Theory (DFT) was used to explain that both the Cu and the hydride ligand surfaces play a vital role in pushing the reduction towards CO2 reduction over HER at low potentials which leads to the formation of HCOOH. The HCOOH formation follows a two steps lattice-hydride reduction; CO2 reacts directly with the capping hydride toform HCOO* which then reacts with another interstitial hydride to form HCOOH, and then the hydride vacancies are readily regeneratedby the electrochemical proton reduction. Fig. 5. Atomic structure of Cu32H20L12 nanocluster (L=S2PH2). Color code: orange, Cu; green, hydride; yellow, S; purple, P; white, H on the dithiophosphate ligands. Different types of hydrides are indicated by the arrows, from . Kim et al , have shown that by ordering the atomic transformation of AuCu nanoparticles, one could activate them as selective electrocatalyst for CO2 reduction. Unlike the disordered alloy nanoparticles which showed preference for HER, the ordered AuCu nanoparticles selectively reduce CO2 to CO at an FE of 80%. A structural investigation reveals that this enhanced catalytic activity for the ordered AuCu nanoparticles was due to the formation of a compressively strained three-atoms-thick gold overlayer that form over the intermetallic core following the ordering transformation. This therefore suggests that surface enrichment of gold at the atomic level may be the origin of the enhanced catalytic behavior. Please click here to view table2. In this review, we have discussed the mechanistic behavior of CO2 electrochemical reduction on various copper/copper based catalytic materials. Details of how certain morphological features, and other factors that determines the selectivity of the reaction to target products were also discussed (also summarized in Table 2 ) with the hope that this would spark up an improved interest to explore copper and copper based materials in order to solve the world’s energy and environmental challenges. 1. M.S. Dresselhaus and I.L. Thomas, (2001) Nature, 414:332 . 2. S. Chu and A. Majumdar, (2012) Nature, 488:294 . 3. J.G. Canadell, C. Le Quéré, M.R. Raupach, C.B. Field, E.T. Buitenhuis, P. Ciais, T.J. Conway, N.P. Gillett, R.A. Houghton, and G. Marland, (2007) Proc. Natl. Acad. Sci., 104:18866–18870 . 4. P. Tans and R. Keeling, (2013) URL Http//Www. Esrl. Noaa. Gov/Gmd/Ccgg/Trends, . 5. D.R. Feldman, W.D. Collins, P.J. Gero, M.S. Torn, E.J. Mlawer, and T.R. Shippert, (2015) Nature, 519:339 . 6. M.E. Mann, (2009) Proc. Natl. Acad. Sci., pnas-0901303106 . 7. D. Larcher and J.-M. Tarascon, (2015) Nat. Chem., 7:19 . 8. J.D. Figueroa, T. Fout, S. Plasynski, H. McIlvried, and R.D. Srivastava, (2008) Int. J. Greenh. Gas Control, 2:9–20 . 9. A.A. Olajire, (2010) Energy, 35:2610–2628 . 10. N. MacDowell, N. Florin, A. Buchard, J. Hallett, A. Galindo, G. Jackson, C.S. Adjiman, C.K. Williams, N. Shah, and P. Fennell, (2010) Energy Environ. Sci., 3:1645–1669 . 11. E. V Kondratenko, G. Mul, J. Baltrusaitis, G.O. Larrazábal, and J. Pérez-Ramírez, (2013) Energy Environ. Sci., 6:3112–3135 . 12. N.S. Spinner, J.A. Vega, and W.E. Mustain, (2012) Catal. Sci. Technol., 2:19–28 . 13. D.T. Whipple and P.J.A. Kenis, (2010) J. Phys. Chem. Lett., 1:3451–3458 . 14. Y. Hori, Electrochemical CO2 Reduction on Metal Electrodes BT - Modern Aspects of Electrochemistry, in: Ed. by C.G. Vayenas, R.E. White, and M.E. Gamboa-Aldeco, Springer New York, New York, NY (2008), pp. 89–189. 15. M. Jitaru, D.A. Lowy, M. Toma, B.C. Toma, and L. Oniciu, (1997) J. Appl. Electrochem., 27:875–889 . 16. C.M. Sanchez-Sanchez, V. Montiel, D.A. Tryk, A. Aldaz, and A. Fujishima, (2001) Pure Appl. Chem., 73:1917–1927 . 17. C.S. Chen, A.D. Handoko, J.H. Wan, L. Ma, D. Ren, and B.S. Yeo, (2015) Catal. Sci. Technol., 5:161–168 . 18. W. Zhu, R. Michalsky, Ö. Metin, H. Lv, S. Guo, C.J. Wright, X. Sun, A.A. Peterson, and S. Sun, (2013) J. Am. Chem. Soc., 135:16833–16836 . 19. S. Zhang, P. Kang, S. Ubnoske, M.K. Brennaman, N. Song, R.L. House, J.T. Glass, and T.J. Meyer, (2014) J. Am. Chem. Soc., 136:7845–7848 . 20. N. Hoshi, M. Kato, and Y. Hori, (1997) J. Electroanal. Chem., 440:283–286 . 21. Y. Hori, H. Wakebe, T. Tsukamoto, and O. Koga, (1994) Electrochim. Acta, 39:1833–1839 . 22. J.L. DiMeglio and J. Rosenthal, (2013) J. Am. Chem. Soc., 135:8798–8801 . 23. C. Ding, A. Li, S.-M. Lu, H. Zhang, and C. Li, (2016) ACS Catal., 6:6438–6443 . 24. C.H. Lee and M.W. Kanan, (2014) ACS Catal., 5:465–469 . 25. D.H. Won, H. Shin, J. Koh, J. Chung, H.S. Lee, H. Kim, and S.I. Woo, (2016) Angew. Chemie Int. Ed., 55:9297–9300 . 26. A.S. Varela, N. Ranjbar Sahraie, J. Steinberg, W. Ju, H. Oh, and P. Strasser, (2015) Angew. Chemie Int. Ed., 54:10758–10762 . 27. Y. Liu, S. Chen, X. Quan, and H. Yu, (2015) J. Am. Chem. Soc., 137:11631–11636 . 28. K.P. Kuhl, E.R. Cave, D.N. Abram, and T.F. Jaramillo, (2012) Energy Environ. Sci., 5:7050–7059 . 29. R.J. Lim, M. Xie, M.A. Sk, J.-M. Lee, A. Fisher, X. Wang, and K.H. Lim, (2014) Catal. Today, 233:169–180 . 30. R. Schlögl, (2015) Angew. Chemie Int. Ed., 54:3465–3520 . 31. J. Qiao, Y. Liu, F. Hong, and J. Zhang, (2014) Chem. Soc. Rev., 43:631–675 . 32. J. Albo, M. Alvarez-Guerra, P. Castaño, and A. Irabien, (2015) Green Chem., 17:2304–2324 . 33. J.W. Vickers, D. Alfonso, and D.R. Kauffman, (2017) Energy Technol., 5:775–795 . 34. A. Loiudice, P. Lobaccaro, E.A. Kamali, T. Thao, B.H. Huang, J.W. Ager, and R. Buonsanti, (2016) Angew. Chemie Int. Ed., 55:5789–5792 . 35. Y. Song, R. Peng, D.K. Hensley, P. V Bonnesen, L. Liang, Z. Wu, H.M. Meyer III, M. Chi, C. Ma, and B.G. Sumpter, (2016) ChemistrySelect, 1:6055–6061 . 36. Z. Chang, S. Huo, W. Zhang, J. Fang, and H. Wang, (2017) J. Phys. Chem. C, 121:11368–11379 . 37. S. Ma, M. Sadakiyo, M. Heima, R. Luo, R.T. Haasch, J.I. Gold, M. Yamauchi, and P.J.A. Kenis, (2016) J. Am. Chem. Soc., 139:47–50 . 38. Y. Lum, Y. Kwon, P. Lobaccaro, L. Chen, E.L. Clark, A.T. Bell, and J.W. Ager, (2015) ACS Catal., 6:202–209 . 39. C. Hahn, T. Hatsukade, Y.-G. Kim, A. Vailionis, J.H. Baricuatro, D.C. Higgins, S.A. Nitopi, M.P. Soriaga, and T.F. Jaramillo, (2017) Proc. Natl. Acad. Sci., 114:5918–5923 . 40. F.-Y. Zhang, T. Sheng, N. Tian, L. Liu, C. Xiao, B.-A. Lu, B.-B. Xu, Z.-Y. Zhou, and S.-G. Sun, (2017) Chem. Commun., 53:8085–8088 . 41. X. Yang, E.A. Fugate, Y. Mueanngern, and L.R. Baker, (2016) ACS Catal., 7:177–180 . 42. S. Sen, D. Liu, and G.T.R. Palmore, (2014) Acs Catal., 4:3091–3095 . 43. D. Ren, B.S.-H. Ang, and B.S. Yeo, (2016) Acs Catal., 6:8239–8247 . 44. D. Ren, Y. Deng, A.D. Handoko, C.S. Chen, S. Malkhandi, and B.S. Yeo, (2015) ACS Catal., 5:2814–2821 . 45. C. Reller, R. Krause, E. Volkova, B. Schmid, S. Neubauer, A. Rucki, M. Schuster, and G. Schmid, (2017) Adv. Energy Mater., 7:1602114 . 46. Q. Li, J. Fu, W. Zhu, Z. Chen, B. Shen, L. Wu, Z. Xi, T. Wang, G. Lu, and J. Zhu, (2017) J. Am. Chem. Soc., 139:4290–4293 . 47. M. Le, M. Ren, Z. Zhang, P.T. Sprunger, R.L. Kurtz, and J.C. Flake, (2011) J. Electrochem. Soc., 158:E45–E49 . 48. F.-S. Ke, X.-C. Liu, J. Wu, P.P. Sharma, Z.-Y. Zhou, J. Qiao, and X.-D. Zhou, (2017) Catal. Today, 288:18–23 . 49. R. Kas, R. Kortlever, A. Milbrat, M.T.M. Koper, G. Mul, and J. Baltrusaitis, (2014) Phys. Chem. Chem. Phys., 16:12194–12201 . 50. M.N. Hossain, J. Wen, and A. Chen, (2017) Sci. Rep., 7:3184 . 51. T.T.H. Hoang, S. Ma, J.I. Gold, P.J.A. Kenis, and A.A. Gewirth, (2017) ACS Catal., 7:3313–3321 . 52. A.D. Handoko, C.W. Ong, Y. Huang, Z.G. Lee, L. Lin, G.B. Panetti, and B.S. Yeo, (2016) J. Phys. Chem. C, 120:20058–20067 . 53. D. Gao, I. Zegkinoglou, N.J. Divins, F. Scholten, I. Sinev, P. Grosse, and B. Roldan Cuenya, (2017) ACS Nano, 11:4825–4831 . 54. A. Dutta, M. Rahaman, N.C. Luedi, M. Mohos, and P. Broekmann, (2016) ACS Catal., 6:3804–3814 . 55. J. Chung, J. Koh, E.-H. Kim, and S.I. Woo, (2016) Phys. Chem. Chem. Phys., 18:6252–6258 . 56. C.S. Chen, J.H. Wan, and B.S. Yeo, (2015) J. Phys. Chem. C, 119:26875–26882 . 57. G. Keerthiga, B. Viswanathan, C.A. Pulikottil, and R. Chetty, (2012) Bonfring Int. J. Ind. Eng. Manag. Sci., 2:41–43 . 58. E. Andrews, M. Ren, F. Wang, Z. Zhang, P. Sprunger, R. Kurtz, and J. Flake, (2013) J. Electrochem. Soc., 160:H841–H846 . 59. W. Lv, J. Zhou, J. Bei, R. Zhang, F. Kong, and W. Wang, (2016) Int. J. Electrochem. Sci., 6183–6191 . 60. Q. Tang, Y. Lee, D.-Y. Li, W. Choi, C.W. Liu, D. Lee, and D. Jiang, (2017) J. Am. Chem. Soc., 139:9728–9736 . 61. D. Kim, C. Xie, N. Becknell, Y. Yu, M. Karamad, K. Chan, E.J. Crumlin, J.K. Nørskov, and P. Yang, (2017) J. Am. Chem. Soc., 139:8329–8336 . How to cite this manuscript: Amos, P.I. *, Louis, H, Kayode A.A, Eno E.A, Akakuru O.U, and Magu T.O. Understanding the Mechanism of Electrochemical Reduction of CO2 Using Cu/Cu-Based Electrodes: A Review. 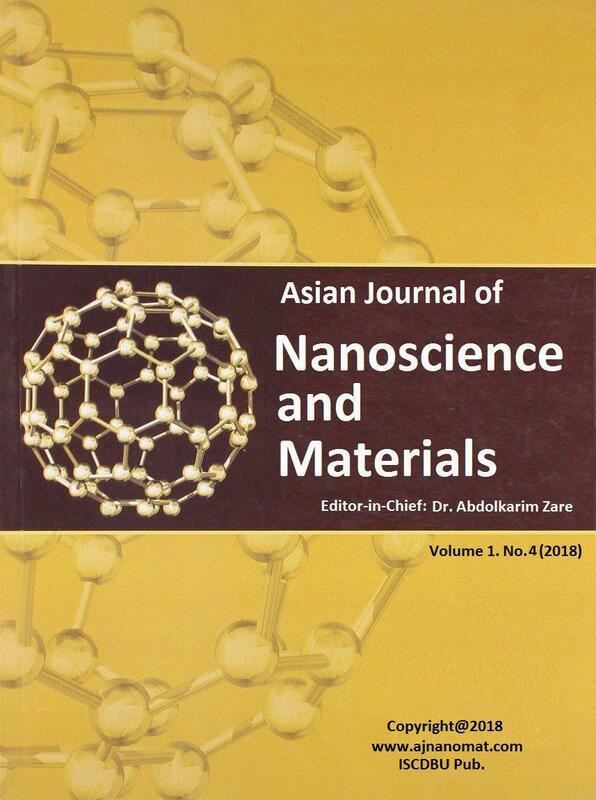 Asian Journal of Nanoscience and Materials, 2018, 1, 183-224.